FROM Los Angeles: 1)Take Highway 1 North to the Channel Islands off ramp. Go west on Channel Islands Boulevard until you reach Victoria Avenue. Turn left on Victoria to Camp Coast Guard (on the left side, next to the Coast Guard Recruiting Station, 4202 Victoria Avenue, Oxnard, California). 2)Take US 101 North to the Victoria Avenue off ramp. Go south on Victoria Avenue to Camp Coast Guard (on the left side, next to the Coast Guard Recruiting Station, 4202 Victoria Avenue, Oxnard, California). -- FROM Santa Barbara or San Francisco, take US 101 South to Victoria Ave. Go south on Victoria Avenue to Camp Coast Guard (on the left side, next to the Coast Guard Recruiting Station, 4202 Victoria Avenue, Oxnard, California). Check-in with manager at first RV on right. Active, National Guard, Reservists, Retired, DOD Civilians, 100% DAV. Maximum of 2 non-vicious dogs allowed. Maximum 2 cats allowed. All pets must be licensed, leashed, and must be attended at all times. 30 day stay limit, then must be out for 7 days before returning. There are no sanitary hookups. There is a dump station available. Just minutes away from swimming, surfing, surf fishing, hiking, charter boat fishing, boating, shopping, and bicycle touring. 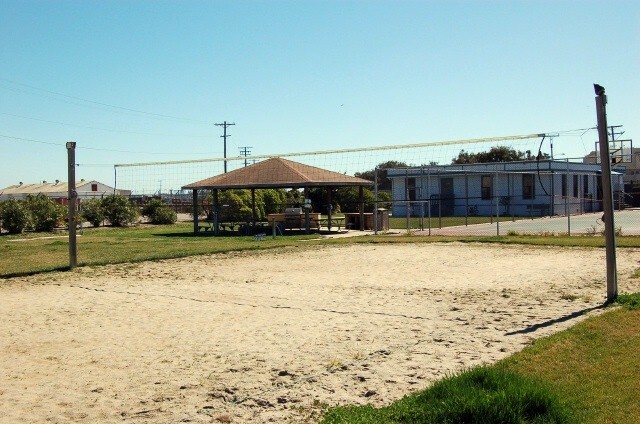 Volleyball, basketball court, horseshoes, and picnic pavilion. OK to possess firearms while parked in our RV park but they must be unloaded at all times. Don't bother trying to get in here. Just called and they told me Active Duty are fully maxing out their sites. Further, they told me there is no time limit so, essentially, they're reserving every site for on-board active duty personnel. Reservations clerk told me that, although they have rules regarding time limits, they pay no attention to them unless there is some sort of issue. Further, she told me the only site they offer (1) is an "Overflow" site. Keep on moving, don't bother here. Claustrophobic is the only word that comes to mind. Way too much road noise, to small and no amenities. We are moving to Fairways RV Resort just up the road. Triple Dolphin Properties is running this campground and from what I can see it's putting no money back into the facility. It has the feel of a place that someone doesn't care about. It needs to be opened up for bidding to someone who really cares about this site. Have to pick weeds in common areas when camp manager requires it, including your family. Usually weekends. I got kicked out cause I wouldn't do it, they kept my pre-paid rent anyway. Manager is rude and obnoxious. Don't stay there, find someplace else. Manager never spent 5 minutes in the service and doesn't know a thing about it. CWO4 USN RET. T.L. left this review using the Directory software: Good for overnight stay. Did not stay, but drove by to check it out. Manager is very nice. The camp is co-located with RV storage -- only $35/month if you have the need for short-term storage. I seriously doubt the 30 day limit (then out 7) is being enforced, since it appeared some of the same RV's were parked in the same slot as in the picture that was taken nearly a year ago. Suspect many of these folks are homesteading here. The place was not neat and tidy like we in the military have grown accustomed to. If Port Hueneme or Point Mugu are available, then I would go there and pay the extra few bucks. A lot could be done (with no money) to make this place much nicer than it is. One of which would be to enforce the "out 7" rule which somewhat forces everyone to pickup their stuff at least once a month. One word of caution... call to make sure you have a spot before entering, since when you turn left off Victoria, you are trapped and will have to backup to turn around. If the camp sites are full, then finding a place to back around could provide a very unpleasant experience. A simple place to park for the night. Not the greatest location directly on a noisy and busy highway. Sites are unimproved, yet they were in the middle of installing new utility poles with 30amp electric. This park may be okay for those wanting to save a few bucks, or have another reason, but the nearby Navy RV Park is a much better choice for us. 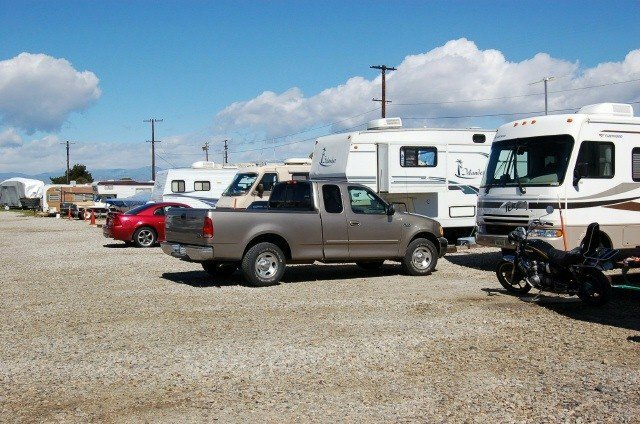 This is a small RV park with older RVs that have owners who mainly stay there on a month to month basis and they are very friendly. The site host is very nice and accommodating. She has the inside scoop on all the local restaurants and local Things Going on. Not the most amenities on site. No laundry, bathrooms, or showers it is still worth the stop off. Just be fully contained and you will be set. The sites are not made of concrete but rather all have small rocks. The base with the exchange commissary is just a few miles away. I like that you do not have to pass through the sentry gate to get in to the RV park but still have a sense of security. A stunning beach is across the street about a mile down the road to the left. Fishing piers and jetties are across the street with a small (very small) kids beach that is protected by the canal. No waves to contend with. The main road is just on the outside of the fence line and that leads to a bit of noise but nothing that bad. If you like to bike there are flat bike trails all around. Not bad. Small, right next to a moderately busy local road, but not so noisy. This road is across from the fishing boats and marinas in the channel to the Channel Islands. Surprising nice and quiet little "bay type" beach. Five blocks to very nice Pacific Ocean beach for sunbathing, swimming and surfing. Quiet little community with the road ending and circling back to Oxnard. Only a couple of miles on same road to the huge Port Hueneme facilities. A little "informal" (would "tacky" be too harsh?) with non-comforming RV's and rustic grounds. All this should change shortly. Might move it up to 4 stars. According to Molly, the full time host, the entire location will be getting a Fall '06 upgrade to 50 amps, sewer hookups and water.